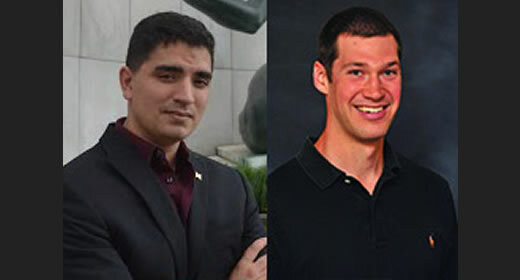 Incoming MPP/MBA candidates Brian Garcia and Brian McMillan have been selected to receive the prestigious David Bohnett Foundation Leadership and Public Service Fellowship. The foundation will pay full tuition for two years for both Garcia and McMillan and will provide a $6,000 summer internship stipend. Both Garcia and McMillan commit to completing a ten-week, full-time summer internship with the City of Detroit Mayor's Office. Brian McMillan, who will be a dual-degree candidate at the Ford School and the Ross School of Business, graduated from Dartmouth College and currently teaches elementary school students with Teach for America in San Francisco. He also serves as a reserve firefighter in the Bay area. Brian Garcia, also a MPP/MBA dual-degree candidate, is a U-M alumnus (BA '08) and a four-year U.S. Army veteran. He currently works as a program coordinator at Racquet-Up, a Detroit-area youth development program. This year marks the fourth year that the David Bohnett Foundation has partnered with the Ford School to award the highly competitive fellowship. In March, the foundation announced a $374,000 gift to expand the fellowship for an additional three years. In 2010, the Ford School joined NYU and UCLA as hosts of the David Bohnett Foundation Leadership and Public Service Program. David Bohnett is a University of Michigan alumnus (MBA '80). The foundation that bears his name is committed to improving society through social activism.